Hola, today we're taking a look at Scripty Bday which was hand-lettered. We're giving you some great birthday/celebratory sayings in this little set! The bouncy, fun design of the scripty adds a playful yet elegant element to your designs! This will become one of my go-to birthday sentiment sets! Sweet! Excited for this release! Love the font and those sweet elephants! Oooh more stamps to add to my collection!!! That font is so beautiful ! Beautiful font & love the variety of sentiments! So cute. Awesome cards and love the images and dies. 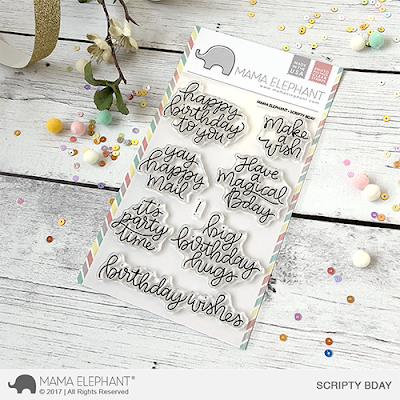 I still can't get over how cute the new elephant set is, and this sentiment set is great too. ME always has the best fonts. Lovely script :) The font is beautiful! Brilliant hand written font sentiments. Would love to own these.